Tyres play an important role in keeping you and your passengers safe on the road. They are responsible for keeping your vehicle in contact with the road surface during braking, cornering and accelerating and their importance cannot be underestimated. What is the legal tread depth? Why is tyre tread depth so vital? In an independent test by Autoexpress, a Ford Focus on a wet motorway with tyres on 1.8mm was shown to take 44 meters extra (that’s TEN car lengths) to stop from 70mph than the same car fitted with tyres having 3.0mm of tread. Alarmingly, once the car with the 3mm tyres had stopped, the vehicle with the lower tread had only managed to slow to 50mph. 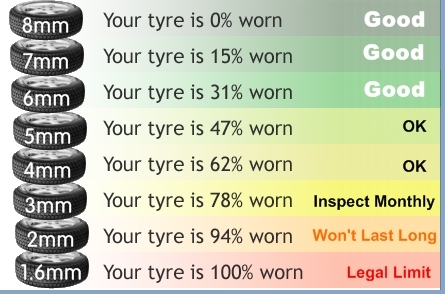 Test such as this continually show that tyres on or near 1.6mm of tread have little or no wet grip performance and can greatly increase you chances of having an accident on a wet road. The legal limit of 1.6mm dates back to 1992 when new cars were fitted with skinner tyres which had a smaller diameter. Pre 1992, the limit was just 1mm. New cars have bigger fatter tyres and present a larger contact path which in the dry which equates to more grip. In the wet however, these wider tyres need less water pressure underneath them to lift the car up and start it aquaplaning. Our advice is to seriously consider replacing your tyres once they reach 3mm for greater safety and control in the wet. 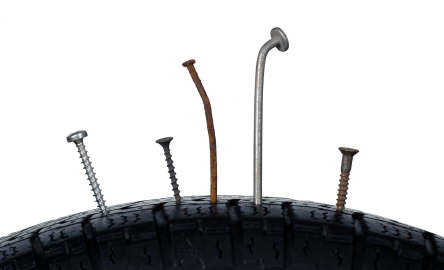 Pop in and see us at any of our branches and we’ll measure your tread depth and check your tyre condition for free. We’ll also be more than happy to show you how to accurately check your tread depth yourself if you’re not sure how to!